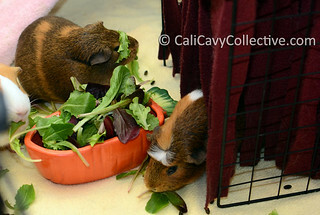 Cali Cavy Collective: a blog about all things guinea pig: Lettuce? What lettuce? Belka got a little too enthusiastic with dinner the other day. After she pulled her head out of the food bowl she had a leaf of lettuce draped square across her face. Undaunted, Belka continued chowing down with a studied nonchalance. Somehow she managed to keep her green eye mask on for most of the meal. What a silly piggy.